The Smashing Pumpkins are an American alternative rock band that formed in Chicago, Illinois in 1988. Formed by Billy Corgan (vocals, guitar) and James Iha (guitar), the band has included Jimmy Chamberlin (drums), D'arcy Wretzky (bass), and Melissa Auf der Maur (bass), and currently includes Jeff Schroeder (guitar, backing vocals) Mike Byrne (drums), and Nicole Fiorentino (bass guitar, backing vocals) amongst its membership. Disavowing the punk rock roots of many of their alt-rock contemporaries, the Pumpkins have a diverse, densely layered and guitar-heavy sound, containing elements of gothic rock, grunge, heavy metal, dream pop, psychedelic rock, progressive rock, shoegazer-style production and, in later recordings, electronica. 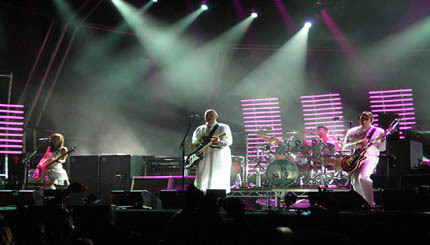 Frontman Billy Corgan is the group's primary songwriter—his grand musical ambitions and cathartic lyrics have shaped the band's albums and songs, which have been described as "anguished, bruised reports from Billy Corgan's nightmare-land".